WINNER shared their excitement for their upcoming 1st world tour, 'Everywhere'! The group's world tour is set to launch in Seoul through 'WINNER 2018 Everywhere Tour in Seoul' this August 19 at 6 PM KST at the Olympic Gymnastics Arena. 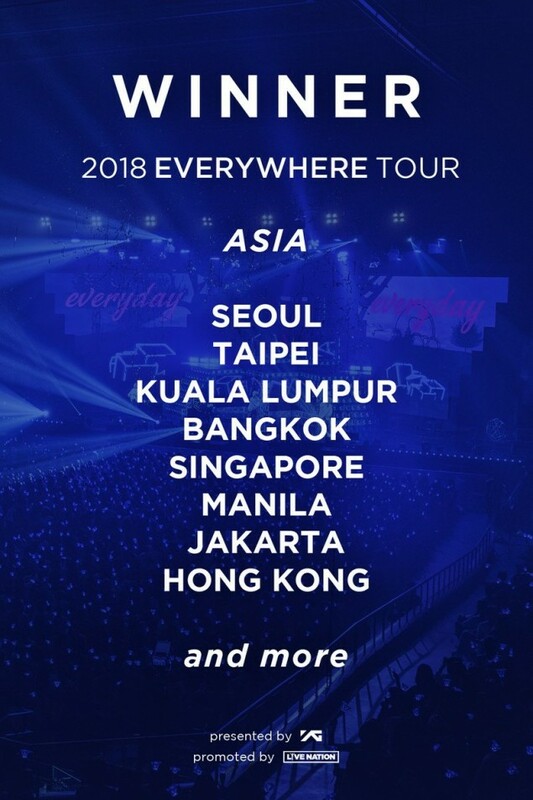 Afterward, the tour is headed off to various Asia stops including Taipei, Kuala Lumpur, Bangkok, Singapore, Manila, Jakarta, and Hong Kong, with more cities being added soon. Kang Seung Yoon said, "We were disappointed that we did not have many chances to meet our overseas fans up until now, so we will create a great tour that will be able to chase away all of that disappointment." Kim Jin Woo added, "I'm so happy to be able to see Inner Circles all around the world." Song Min Ho stated, "We have a lot more WINNER songs now so we are preparing various stages." Finally, Lee Seung Hoon relayed,"We will prepare perfectly so that we can share this happiness with fans." Tickets for WINNER's Seoul concert go on sale this July 12 at 8 PM KST. Do you want to see WINNER coming to your city?